Searching for the perfect Movember event ideas to tie in with Men’s Health Month this November? 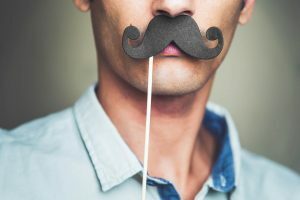 Here at New Leaf Health we love a great cause, so we’re delighted to offer up some ideas for workplace events for Movember so that you can start raising money in aid of men’s health! If you aren’t familiar with what Movember stands for, head over to the Movember Foundation’s website to learn more about this fantastic cause. It’s unfortunate that Movember is named after something only half the population are blessed with (less than that even, considering the follicly challenged). So this is where you may have to get a little creative. Literally. Sure, you can get all the guys in the office compete to see who grows the most impressive ‘tache and judge a winner at the end, but where’s the fun in that? Let people design and make their own moustaches! You can charge just a couple of pounds to enter (or even a free event, if you’re just raising awareness), and let staff create their own fantasy facial hair, Blue Peter style. Think pipe-cleaners, felt, cotton wool, craft paper – whatever works! Not only is this an inclusive event, promoting morale throughout the workplace, but it can be a great opportunity to open up a dialogue with your staff and discuss genuine health concerns, no matter the gender. Depending on how your staff feel around the issue, you may even consider following up with an on-site health check in order to get a clearer picture on the state of employee health in your organisation. Each hour 60 men worldwide commit suicide. That’s one per minute. During November, the Movember Foundation suggest attempting to walk or run 60km in order to raise awareness around this issue, and to help generate sponsorship and donations for the cause. This doesn’t just have to be an individual effort though, as the whole workplace can get involved – even inspiring a little friendly competition! Set up a treadmill or exercise bike in your workplace, or even set up laps around the building. Then ask employees to spend a little of their time during a lunch break, or maybe even before or after a shift to rack up a few kilometres for the company! Depending on how many staff you have, this may be a fairly easy target, so perhaps push yourselves a little further – or even split the workplace into teams and have departments compete to see who can go the furthest! There are some fantastic resources to get you start over at the Movember Foundation’s website. This is also a great opportunity to talk to your staff frankly about mental health, and how the workplace can have a negative impact if the proper balance isn’t achieved. If necessary, following up with some mental health training or awareness courses can make a huge difference, and show your employees that you really care about them. Movember isn’t just for the guys who can grow facial hair – there are plenty of ways to get the whole workplace involved! It doesn’t necessarily have to take place in a pub (maybe a Canteen Quiz might work?) but this one is bound to promote camaraderie amongst employees, as well as raise funds for an excellent cause. Split the workplace into teams and set an entry fee, say £10 per team, then nominate a quizmaster to ask all the questions; maybe even the MD – it’s the only time an employee wouldn’t mind getting questioned by them! The questions can be facial hair themed (a ‘Guess the Celebrity Facial Hair’ picture round) or simply general knowledge. There are plenty of free online resources available for the time-strapped to put together a great quiz in just a few minutes. Keeping on theme with the pub and (men’s) health, you can use the platform to talk to your employees about the negative impacts of alcohol and tobacco, plus other unhealthy habits, and how they can lead to physical and mental health problems that affect both home and work life. If this is a sore spot for your employees, they may benefit from attending an on-site Wellbeing Roadshow, which can include topics such as tobacco and alcohol, amongst other health issues. Yes, this one is pulled straight from the primary school playbook – a good old fashioned mufti day. You can opt for a simple office-wide jeans and t-shirt day, or go a little further with a full-on theme – the 80s is always a safe (and entertaining) choice. Not only is this a simple and fantastic way to create a bit of fun in the workplace, but it also provides the perfect opportunity to promote the cause with internal communications – and the best bit is that it’s easy for everyone to get involved! Ask staff to make a small donation, just a couple of pounds, in order to join in – it will soon add up! To boost your donation, you can even offer to match employees’ contributions as a company, which will help promote camaraderie. Of course, men’s health isn’t just for November, and promoting health awareness in the workplace is one of the most important things you can do to ensure your employees’ long term health and wellbeing, and ultimately their happiness. This can be through simply taking the time to chat to your employees about their mental and physical wellbeing, or holding regular awareness days around the workplace to promote knowledge and acceptance. Ultimately, the goal is to create a more welcoming company culture, where staff feel happy to address their concerns, leading to a happier, healthier workplace. To learn more about the kind of services you can provide for your employees, visit the on-site events section of our website. Alternately, call 01384 877 855 or email enquiries@newleafhealth.co.uk and a member of the team will get back to you. To learn more about men’s health this November, visit the Movember Foundation’s website.